Our Granite Renewal Process was recently tested in multiple homes by an independent lab. This study found that our Granite Countertop Renewal process, in conjunction with a sanitizer, removes an average of 98.4% of bacteria from granite countertops! Granite countertops are both a durable and beautiful option for your home. Granite resists chipping, scratching, cracking and is heat resistant. With proper care and maintenance, you should be able to enjoy its natural beauty for many years. Over time, granite will lose some of its beauty and shine due to hard water, dirt and build up. Granite is porous, which means that, even if a sealant was applied during installation, or if it is a treated 10 year granite, the sealant can wear thin and allow staining liquids to seep through. Regular maintenance on granite can help keep and restore the beauty and shine. The products we use on your granite are Green Certified and they sanitize, clean, seal and protect your granite. N-Hance Wood Renewal now offers granite countertop renewal in conjunction with our revolutionary cabinet and floor renewal. Fall in love with your granite as well as your cabinets and floors all over again when you have our technicians renew these surfaces. Our Granite Renewal Process was recently tested in multiple homes by an independent lab. This study found that our Granite Countertop Renewal process, in conjunction with a sanitizer, removes an average of 98.4% of bacteria from granite countertops. When you want to protect your family and your home surfaces… think of N-Hance! Our trained N-Hance technicians can answer any questions you have about our Granite Renewal process. During the cleaning process we remove the dirt, oils, grime and hard water that makes granite counters look dull over time. 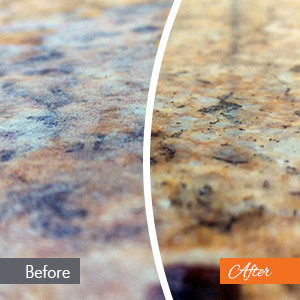 We sanitize the surface to remove an average of 98.4% of bacteria from your granite countertop. Our solutions are non-toxic, so you can be sure your family is safe. Sealing your granite countertops is important to protect your investment. Granite is porous and sealants block liquids from seeping into the granite. This is especially critical if the liquids are a staining color such as wine or grape juice. Our final step is our Granite Polish. The polish not only helps protect, but renews its original beauty and shine.